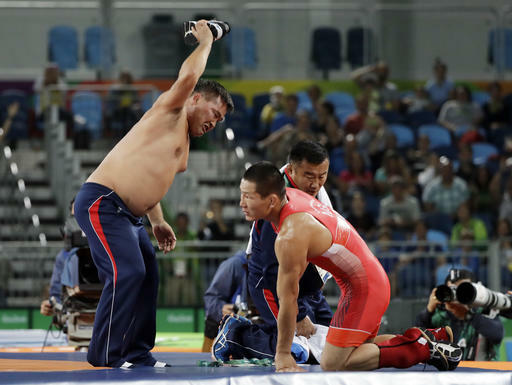 Two Mongolian coaches felt their wrestler was stripped of a bronze medal. So, they stripped in protest. Mandakhnaran Ganzorig appeared to have beaten Uzbekisatn's Ikhtiyor Navruzov 7-6 at 65 kilograms but his coaches challenged the scoring, likely because the Mongolian began running around in celebration with less than 10 seconds left rather than engaging with Navruzov. Navruzov won his challenge and was awarded the match as the last wrestler to score. The Mongolian coaches went much further than that. 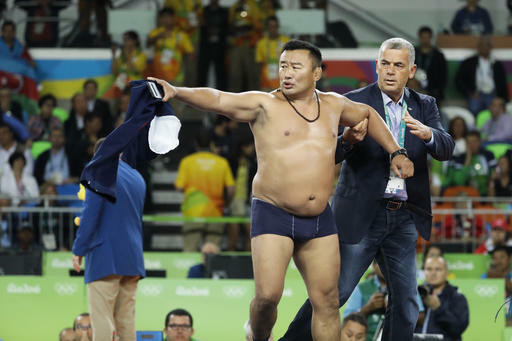 Byambarenchin Bayoraa took his shoes and shirt off and threw them to the mat in disgust in front of the officials.